Volvo's new attack on pedestrians and cyclists is insulting to every traffic user. They have developed what they call "Life Paint" and expect pedestrians and cyclists to spray it on. The problem is that Volvo - and other automobile manufacturers - are the problem. They make products that kill 1.2 million people a year around the world. 35,000 alone in both the European Union and the USA alone. Not to mention the millions injured by cars or the many millions killed slowly by emissions. They continue to pass the buck, to set up smoke screens to make us focus elsewhere and forget the true problem. Look at every tactic the tobacco industry has used over the past 20 years and you see it mirrored in Big Auto. 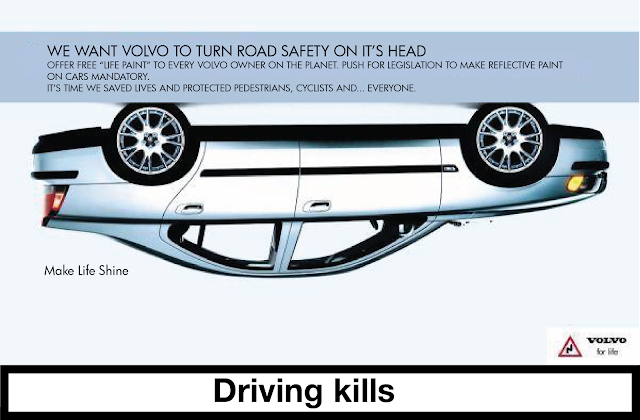 Volvo claims to lead the way in safety, but their Life Paint cannot hide their true colours. Quite simply, we've started a petition. Enough of this Ignoring the Bull in the China Shop. Instead of targeting the vulnerable traffic users and continuing the victim blaming, we insist that Volvo offers free Life Paint to every Volvo owner on the planet so that cars can be illuminated better in cities and rural settings. Get the spray can at the local dealer or get it shipped for free. Spray that car immediately. - Black, grey and silver cars - in that order - are more likely to be involved in crashes, according to a Monash University study. Based on 20 years and 850,000 car crashes. Reflective paint on cars is a no-brainer. - Cars and motorists kill. You read the stats, above. There is a 9-11 every month in America alone and it's been there every single month for over 60 years. Volvo, of all car companies, should be tackling this head on instead of blaming the victims. - Volvo should be lobbying intensely for mandatory reflective paint in every market that they operate in. Their Life Paint should be the jewel in their safety crown. Instead, it's tear gas in the eyes of the victims. - Why stop there, Volvo? What about rational ideas like helmets for motorists or making motorists responsible by forcing them to have external airbags? These ideas exist for good reason. There is science to support them. 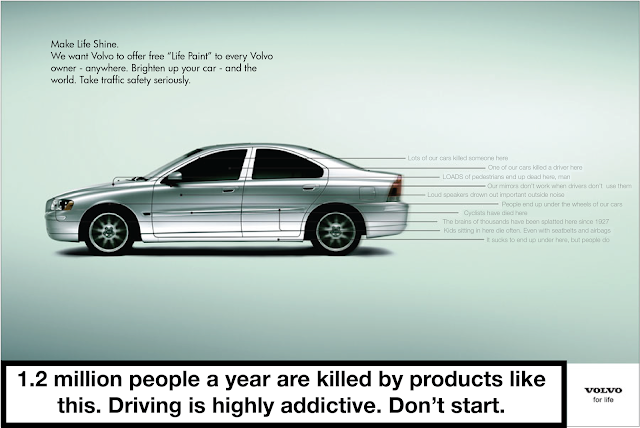 What about health warning legislation on all automobiles? The ills caused by tobacco are virtually the same as those caused by Volvo's products. Sign the petition to get Volvo to offer Life Paint on every car on the roads today.